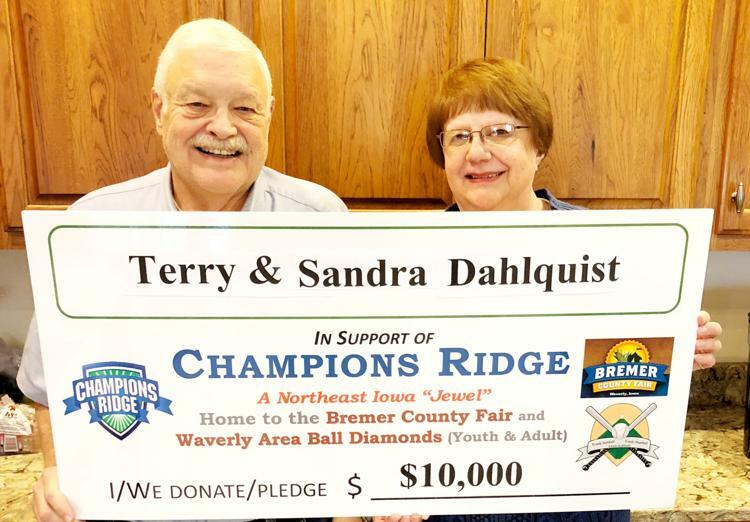 Terry and Sandra Dahlquist recently pledged $10,000 for the Champions Ridge project. 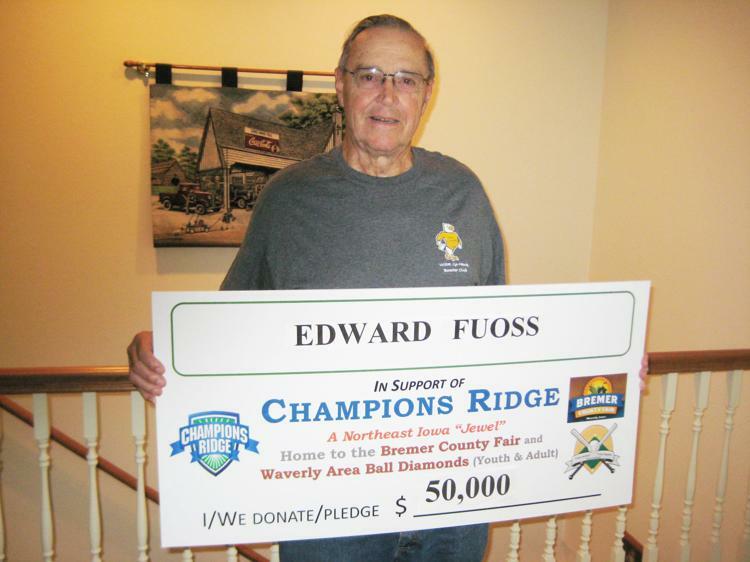 Edward Fuoss holds the oversized check to announce his $50,000 pledge to the Champion’s Ridge project. 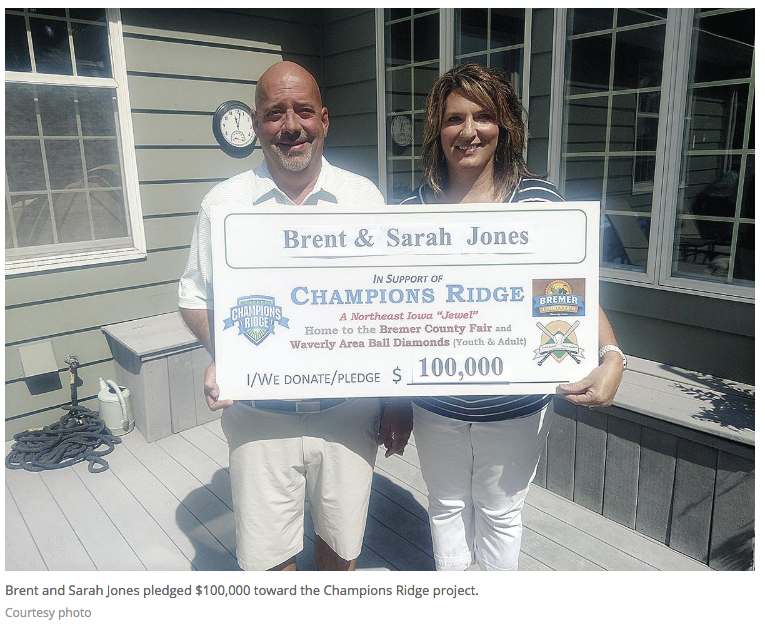 Brent and Sarah Jones pledged $100,000 toward the Champions Ridge project. Read the Waverly newpaper article HERE. 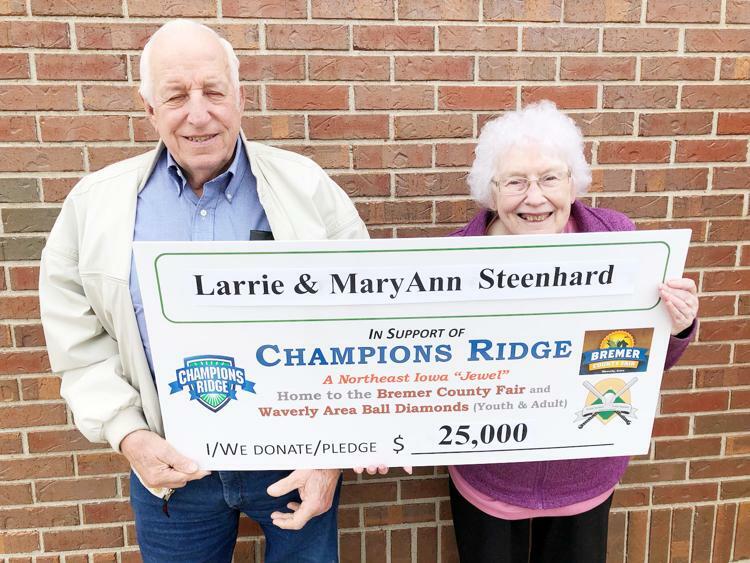 Larrie and MaryAnn Steenhard are one of the most recent donors to the Champions Ridge project, as they pledged $25,000. 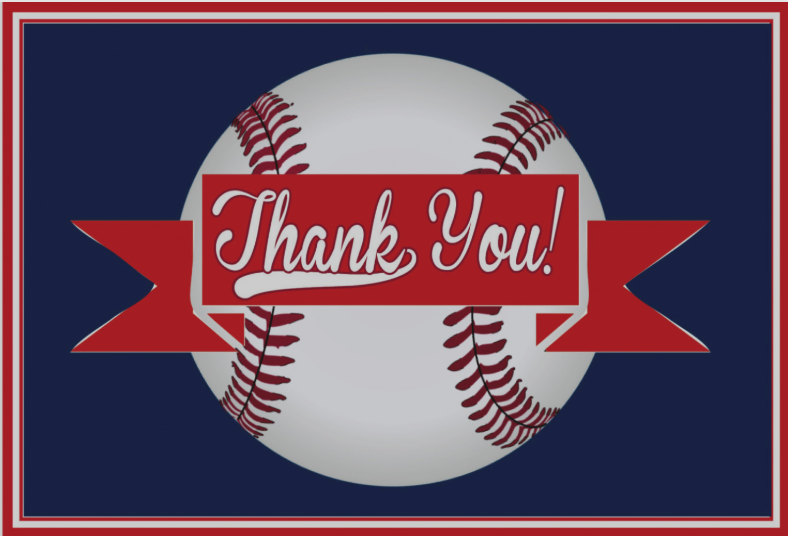 Youth Baseball Tournament Generates $2,500 Donation To Champions Ridge! attracted 29 teams of players ages 9 to 13, with over 330 youth from around northeast Iowa participating. Games were played in three locations, including the Shell Rock, Waverly Kiwanis, and Waverly Memorial Park ball diamonds. 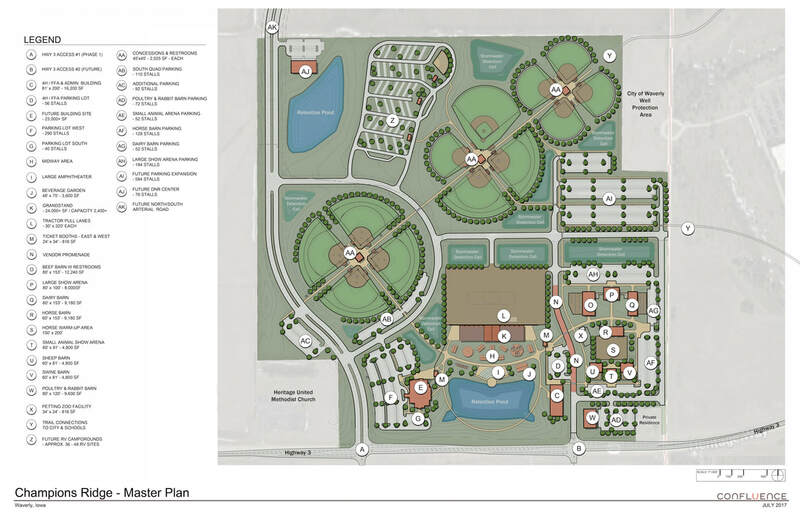 When completed, the Champions Ridge facility will provide enough diamonds to host such tournaments, in a single location with flood-free ball fields and plenty of off-street parking. 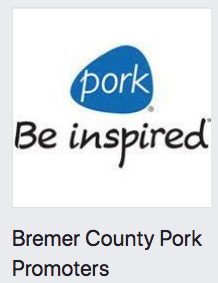 The Champions Ridge governing board expresses its sincere thanks to the Bremer County Pork Producers, Waverly Hy-Vee, and W-SR youth baseball for donating their time and concession items at Saturday’s tournament. which is a joint effort between all Waverly-area ball groups and the Bremer County Fair. A YOUTH AND FAMILY FOCUSED COMPLEX! New 2017 rendering of the Ridge! Each year, thousands of 6- to 19-year-olds will use Champion Ridge’s facilities. Add in adults and families and usage could top tens of thousands. The economic impact could be huge!! The Ridge’s economic impact for Bremer County provides over $1,000,000 every year. Over the next decade, The Ridge will inject TENS of millions into the area economy. During ball tournaments and the Bremer County Fair, everyone (youth, participants, parents, spectators) faces increased pedestrian and vehicle risk at the present 4th Avenue location in Waverly. A new facility removes bottlenecks and hazards with off-street parking – and reduces noise in a residential neighborhood. New cultural events and sports shows, RV camping, an ice rink, a bigger Fair and more large-scale ball tournaments, and youth-centered clinics make Champions Ridge a convenient regional hub. A Permanent Home... With Room To Grow!